Remember a few years ago when The Internship came out? You know, that godawful excuse of a comedy with Owen Wilson and Vince Vaughn that was basically one feature-length ad for Google? Well, over three years later, along comes a film that is not only a far better advert for the search engine (to be precise, its globe-searching tool Google Earth), but is also an infinitely better overall film. Now that might not sound like it’s saying much, because after all almost anything is infinitely better than The Internship, but Lion really is a powerful, emotional tale of the impossible made possible through extraordinary circumstances… and also Google Earth. We begin our tale in 1986 Khandwa, India, where a five-year-old boy named Saroo (newcomer Sunny Pawar) lives a simple existence with his mother and siblings, including older brother Guddu (Abhishek Bharate). One evening, while at a train station waiting for Guddu to look for some night work, Saroo falls asleep on an empty train, and wakes up to find himself 1500 kilometres from home, in the city of Calcutta where the young Hindi boy can barely speak the local Bengali language. Alone on the streets and with only the vaguest of information regarding his hometown, Saroo is soon declared a lost child and later adopted by a nice Australian couple (Nicole Kidman and David Wenham). Twenty-five years later, Saroo (now played by Dev Patel) has settled into his new life in Tasmania, but is still haunted by the memories of his real family, and cannot stop thinking about his traumatic childhood. He sets out to find his real home once and for all with whatever tools he can use, including – you guessed it – Google Earth. The search engine, by the way, is not very prominent in the film except for when it needs to be, which leaves the rest of the film to build momentum as its own instead of being bombarded with countless product placement for the brand. Director Garth Davis, who makes his feature debut here after helming the acclaimed mini-series Top of the Lake, puts the focus solely on Saroo’s journey and the emotional consequences it leads to later in life. He accomplishes this by presenting the story in a linear fashion, having everything played out straight without any sudden flash-forwards to the “present” like any other movie similar to this would have done, which allows you to experience the full weight of the story as the main character himself goes through it. For its first half, which is of young Saroo becoming lost and wandering the streets of Calcutta, it plays like a children’s story in the same vein as The Railway Children, or if someone like Don Bluth had directed Slumdog Millionaire, which draws you in because of the accessibility of the story as well as the powerful scenes that reflect the genuine trauma of a lost child. When it does eventually reach its powerful conclusion, you really feel the strong emotions as Saroo does, because we have gone on this long journey along with him and are finally getting to experience the delayed joy that he is finally experiencing. The linear style of storytelling really allows the audience to become more of a part of the journey than a film that randomly decides to cut back and forth, and I am all the more grateful for that. Although the story is undeniably moving, almost to a point where I was starting to honestly choke up at one or two points, it’s the performances that ultimately make it a truly emotional experience. Patel gives his most weighty performance to date as the adult Saroo, and has never been better than he is in this film (though you have to wonder if at some point casting agents are going to stop typecasting the British-Indian actor in every India-centric Hollywood movie ever made), as is Kidman who, in just a small amount of scenes makes her character extremely sympathetic and a heartbreaking figure that generates some real emotion out of the audience. Rooney Mara, though, tends to get the shorter end of the stick as Saroo’s girlfriend, which is mostly just the standard “supportive girlfriend” role you’ve seen quite a lot, but to her credit it’s a stock character she plays well (besides, if she can play a Native American in Pan, then CLEARLY she can do anything!). It’s a powerful true story brought to life by some emotional direction and heartbreaking performances, and if you’re wondering why the movie is indeed called Lion when no such animal or apparent metaphor seems to feature, wait until the very end; it’s the cherry on top of this delightful cake. 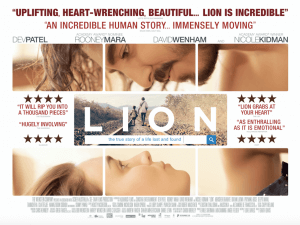 Lion is a powerfully told true story of a lost child and his lifelong struggle to reconnect, told through some emotional – and refreshingly linear – direction and some heartbreaking performances.